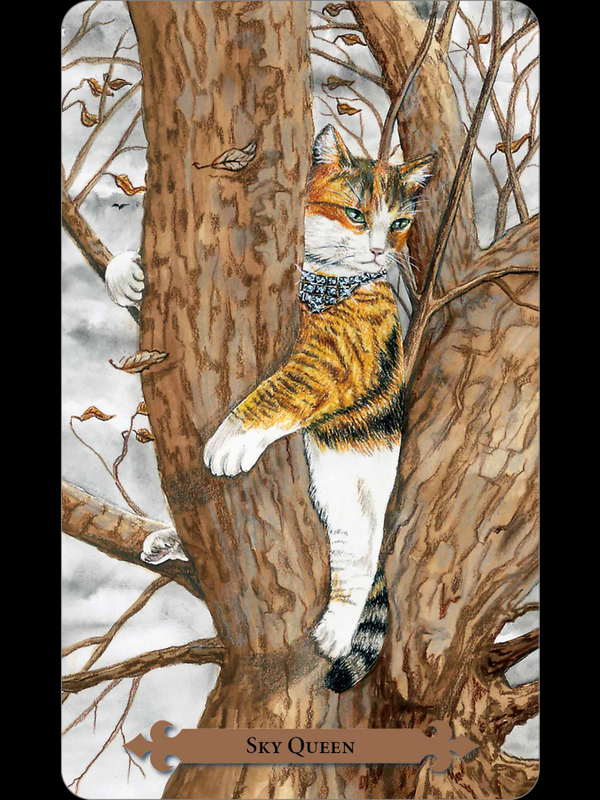 Card: Sky Queen – from the Mystical Cats Tarot by Lunea Weatherstone. Message from the Faeries: This delightful kitty has the right idea. She’s climbed a tall tree so that she can sit and watch everything that’s going on around her. This week, we recommend that you model yourself after the Sky Queen. There are some intense energies following this full moon, and there is a lot of emotional upheaval happening all around you. As tempting as it is to get involved in all the drama that is happening, we recommend that you find a place for you to sit and be the silent observer. You may find yourself getting swept away by these emotional waves, but you would be better off sitting this one out. Whatever is going on around you is most likely not worth all the pain and suffering that you were witnessing all around you. Cat’s are sensitive creatures, and are very empathetic. Most people mistaken their cool demeanour for indifference, but they are just very selective of whom or what they will involve themselves with emotionally. As you feel yourself getting swept away, think to yourself: do I really need to be getting myself so emotionally invested in this? Is it really worth it? Cats show great discernment when it comes to almost everything in their life. Some people are quite put off by how cat’s behave, they think they are snobs and are too picky, but we think that most of you could learn a thing or two from cats. While they too can sometimes be swept away by their emotions, they are often more inclined to make their decisions with a calm, cool and collected mind. They know when they have to be sensible and not sensitive. This week, when things feel like they are spinning out of control, or when things feel too intense, just take that time-out or walk away. Don’t do or say something that you might regret in a heated moment. This week is defintely about taking the high road. You will thankful, in the long run, for choosing the easy way out this time. We love you! Be cool! This entry was posted in Faerie Reading and tagged calm, cats, cool, Faeries, fairy, Oracle, Reading, Tarot by faeriemessenger. Bookmark the permalink.